Is you child about to start school? If so, I have 2 gorgeous Hello Kitty treats up for grabs for one lucky reader. First I have the Hello Kitty Starting to Write book. It is very cute and contains over 100 stickers and a reward chart. It contains some fun, simple activities that encourage beginning writing skills. These include drawing round wheels and apples and tracing all sorts of shapes and finally beginning to trace letters. The pictures are bold bright and colourful . The reward stickers are fun and a good size and reward effort throughout the book. 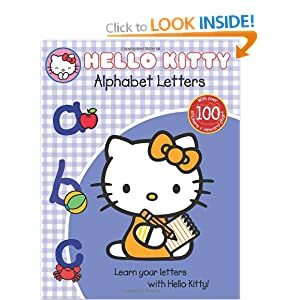 Next we have the gorgeous Hello Kitty Alphabet Letters book. Again it is a good size A4 book with a glossy wipe clean cover. Inside are lots of activities all based around the letters of the alphabet.An example would be T is for teddy draw a teddy here and write a T next to it. It encourages observation and making the letter shapes throughout and it is fun and varied. It also has lots of stickers and a reward chart. Tell me your child’s favourite thing beginning with A B or C to be in with a chance to win. That’s it! Simples . UK entries only . Winner picked at random. Comp closes on Fri 17th August. Next Post Sunday Inspiration Tread softly because you tread on my dreams. C- Is for Clive the cat this is my daughters favourite toy which she takes everywhere, even to pre-school. My 4yr old said his favourite thing beginning with a, b, or c is; Baryonyx ! Fab competition – would be perfect for my daughter! A – adventures involving mud and getting dirty! B – Bettles and all creepy crawlies! That easy he loves Binky his little teddy that goes everywhere we go – we actually have two but Jake doesn’t know that, one has to go in the wash every night as he’s been with Jake in the sandpit, or to the park or helping in the garden or one million & other places that Jake goes in a day! But he goes to bed with an all clean teddy every night. Dirty Binky even has a bath with Jake before going having some fun in the washing machine. One of my daughters favourite things is cheese! Grace’s most favourite thing in the whole wide world is her toy CAMEL called Spotty! Has to be Cuddles from mum when reading a story! My daughter’s favourite thing beginning with ‘B’ is Baby (her little sister to be specific! My daughter loves Bananas and her Balloon in the garden. If you had asked for H I would of said Hello Kitty, she would love this prize!! My daughter’s favourite thing beginning with B is her bear called Spencer! A = Arguing with her sister! My daughter’s favourite thing beginning with B is most definitely Blankie! She still can’t sleep without it, and it is looking decidedly manky now lol. has to be B her baby doll, she is lost without it. Has to be Bed Time Stories – Just one more is a Fave saying at bed time …. my son connor’s favourite things …. C– Connor ! he loves himself as much as we love him hehe ! My child likes bouncy balls especially those from their Noddy reading books! My four year old daughter’s favourite thing is her Accessories! From her hairslides, to her handbags and purses (most of them embellished with Hello Kitty) she loves putting together her very own “look” everyday. She starts school this September so this prize would be fantastic. Thanks for the competition. My little ones loves Animals, especially Cats that are Beautiful like Kitty. Favourite thing beginning with B is bubbles. My son’s would have to be B for Bears. he has more cuddly toes than the build a bear workshop! My daughters most favourite thing in the world are beads!! She’s only four years old and is a true girlie girl!!! My little girl (13months) favourite thing at the moment is Bananas! Shes like a lil monkey, cant get enough of them!! My childs favourite thing is B for BALLOONS – She loves to play with Balloons . “Catty” a teddy cat tha my daughter has had since she was a year old she is now 6! fascinated by caterpillars and all creepy crawlies at the moment. It would have to be Cars! A – Alphablocks on you tube! B – Bluey his blue bear that goes everywhere (well we have two he gets a lovely clean one at bed time! C – Chuclkling, he’s at it all day a real good belly laughing chuckle, its my favourite noise. A is apples, not only does she love eating them but every fruit apparently is am apple! B is baby/baba as that is her nick name and when you say it she answers you with mommy or daddy! C is cats as she really loves fussing our 3 Honey, Nibble and Minnie and calls their names too! Cucumber, she can’t get enough of it. Aunty (emma) who lets my toddler daughter dote on her new baby cousin beth! Bubbles-in the bath, garden, at a party, always guaranteed to make my daughter laugh out loud! Crayons-my daughter spends hours colouring in pictures of her favourite characters, hello kitty being a top one naturally! Bear (her teddy she’s had from birth)! Anpanman – This is a very popular Japanese cartoon, my grandaughter’s mum is Japanese and she loves it. C – Our cat, thankfully our cat is very tolerant and puts up with being crawled after to be touched. The cat had my baby starting to crawl at 6 months -darn cat!!!! My little girl loves to (b)ake (c)akes with her gran! A- Attention – lol she needs attention all the time !! B – Buddy, our dog. She loves to cuddle him and he sleeps on her bed. C – Chocolate !! Sadie adores chocolate and would eat it all the time if I let her ! Pipers favourite thing is her cat. Daisy’s favourite is any animal! crayons, she is a budding litte artist. My daughter starts school in 2 weeks…help!!! Bathtime, books and childcare 🙂 In that order… My son loves making a mess with his sisters in the bath, especially with the bath paints! They all love books, currently loving Were going on a bear hunt, pop up version – read this to my 3 together and my niece and they were all mesmerised! And B would be her Bedtime, with a story or four! til I can take no more! A: Arts and crafts, she is forever making things. Airports, especially when picking up her GaGa (Grandad) who lives in America when he comes to visit. C. Cupcakes pink of course! A = Adventure Walks with Daddy! B = Being such a good girl and eating all her Greens! C = Cuddles with Mummy! Apricots, bananas and cake – can’t be all virtuous eh?! C – Chloe our lovely daughter who is mad on Hello Kitty! My daughters fav thing is c for her 2 cats. CARS! We have more than a dealership scattered everywhere! My daughter loves her Bike!